Build a Windows desktop and server infrastructure in the home! To keep this simple, I'm going to start by introducing the server that I have selected to host the Unit34.co domain in my own home. 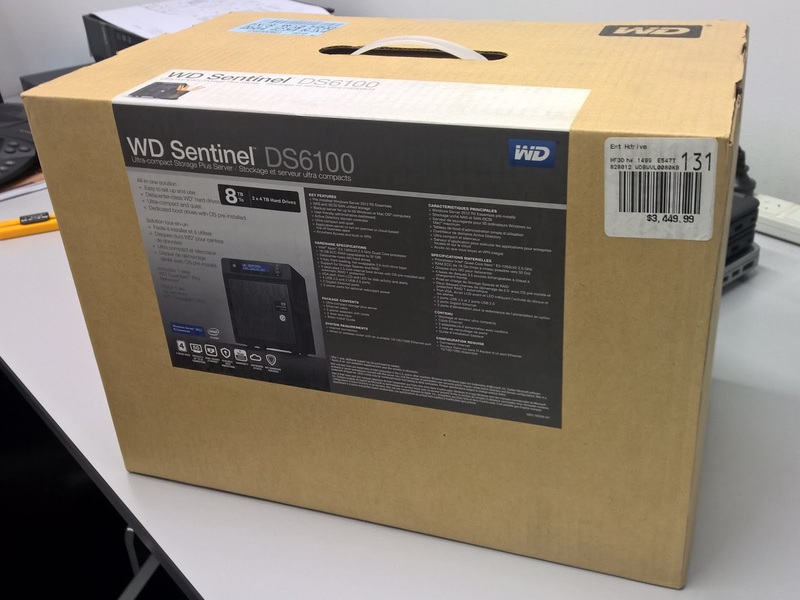 It's the Western Digital Sentinel DS6100. The DS6100 is marketed as a server with storage solution, an ideal first-server for small to medium sized businesses. I have the 8 TB version. I've chosen the DS6100 because it is the most powerful, space-saving, energy efficient server I could afford. It's ideal for the home environment due to its small footprint and quiet operation. Most importantly it has enough grunt for several virtualized workloads and doubles as a NAS. Check out the specs below. Now when selecting a server, the biggest challenge I found was getting all the features I needed at a reasonable cost. As this was going into a home environment, I was keen to keep all the hardware I needed to a minimum, ideally to one box. At the low end of the scale, you have your Network Attached Storage (NAS) and micro server solutions for your average consumer and on the upper end, you have your desktop pedestals and rack mounts for the professionals. You will be looking for something in between as a 'prosumer'. Rather than tell you to get DS6100 or what server to get, I'm going to instead tell you what our server is going to be used for and leave it up to you based on that to select a server suitable to you. You can use the specs of the DS6100 as a guide. Our server will be the primary server for the Unit34.co domain and will be used for two main purposes. The first is as a file server and the second, as a virtual machine host. Our server will be running 24/7. Our plan for Unit34.co is to deploy one physical server and virtualized all the others. In my case I will be deploying the WD Sentinel DS6100 as my physical server with Windows Server 2012 R2 Datacenter installed with plans to upgrade to Windows Server 2016 when released. On this server which I've codenamed Carbon, there will be two server roles installed. They are the File and Storage Services role which is installed by default and Hyper-V.
From then onwards, we'll be deploying servers as Hyper-V virtual machines on Carbon. The most important of these is our domain controller named Hydrogen. The table below is my initial plan for the servers we are going to deploy on our Unit34.co domain. Some of these may be able to be further consolidated. Servers on the Unit34.co domain are named after elements from the periodic table. We've deliberately picked names of elements that are common or well-known and have tried to avoid as much as we can, the names of elements that sound similar. Copyright 2015 Hannah Chan. Simple theme. Powered by Blogger.